In 2013, Countdown chose once again to launch its latest report at the Women Deliver conference, a global gathering to focus attention and build momentum towards a better future for women and girls. Women Deliver 2013, held in Kuala Lumpur, Malaysia, brought together more than 4,500 leaders and advocates representing over 2,200 organizations and 149 countries, for three days of discussion, debate, and action. Countdown presented six well-attended conference sessions that summarized the findings in Countdown’s new Accountability Report; offered new evidence on coverage and equity indicators; analyzed financial flows to reproductive, maternal, newborn, and child health; highlighted the importance of the maternal and newborn health continuum; and provided information on the Country Countdown, a country-led, multi-stakeholder process to use national and sub-national RMNCH data to improve decision-making, progress assessment, and accountability. 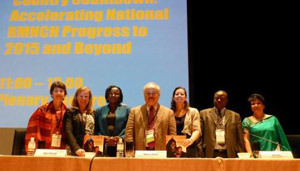 At these sessions, and at an exhibition booth shared with the Partnership for Maternal, Newborn and Child Health; Every Woman, Every Child; and the independent Expert Review Group, Countdown distributed 1,000 copies of its new report and 1,000 USB-drives containing the new report and a range of Country Countdown tools and materials. With attendees from nearly every Countdown country, Women Deliver 2013 offered Countdown an unparalleled opportunity to make its tools and data available for country-level action. On the day after the conference ended, Countdown held a full-day, highly-interactive meeting on “Data as a Tool for Change: Promoting Country-Level Action with a Country Countdown.” At this capacity-building workshop, attendees from more than 25 Countdown countries learned about Countdown tools, heard from experts on the global Countdown partnership, and worked together in country and regional teams to begin planning for implementation of Country Countdowns in their own countries. Presentations from this workshop have been included in the Country Countdown Toolkit.